2 What is seborrheic dermatitis? 3 What are the Symptoms of Seborrheic Dermatitis? 4 What are the Causes of Seborrheic Dermatitis? It is a non-contagious skin disorder mainly affects the scalp of a person. It is marked by red, inflamed skin covered with dry, flaky or greasy scales on the scalp. Apart from the scalp, it may appear on area behinds the ears, the face, eyelashes, chest and back. It is also known as seborrheic eczema. In infants, it is recognized as the cradle cap. It mainly develops within the first few weeks of life. Dandruff is also a type of seborrheic dermatitis with scales or flakes on the scalp but it does not have inflammation of the skin. What are the Causes of Seborrheic Dermatitis? Homeopathic mode of treatment is an ideal way to cure Seborrheic Dermatitis. It treats both acute as well as chronic cases of Seborrheic Dermatitis. Homeopathic remedies reduce the intensity and frequency of Seborrheic Dermatitis. In homeopathy, homeopathic medicines boost the self healing mechanism of the body and strengthen it to fight Seborrheic eczema. 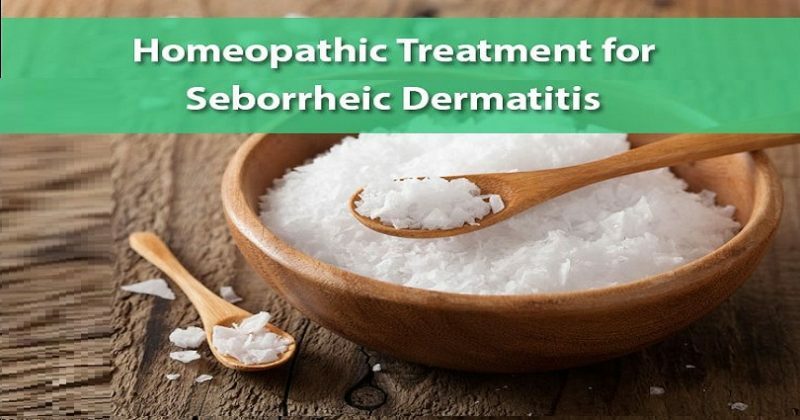 Kali Sulphuricum, Natrum Mur, Thuja Occidentalis, Graphites Naturalis and Phosphorus are the best homeopathic medicines to cure Seborrheic Dermatitis. Kali Sulph tops the list of homeopathic remedies for Seborrheic Dermatitis. It is an ideal cure for Seborrheic Dermatitis cases where yellow flakes on the scalp are present. The scales are sticky and the scalp is moist in nature. It is accompanied by itching. Heat makes the itching worse in some cases. Homeopathic remedy Natrum Mur is also used in cases of Seborrheic Dermatitis when it has greasy, oily scalp with flakiness and redness. The scalp of the patient is covered with white scurfs. The patient may also experience burning sensation on the scalp. The face is oily with redness. Along with the above symptoms, acne on the face may also occur. Graphites Naturalis is another homeopathic medicine to cure Seborrheic Dermatitis where the scales on the scalp are attended with intense itching. The scales get reduced after washing but reappear. A fetid odor may also present on the scalp of the person. The scalp may also remain humid and moist in nature. Falling of hair may also be observed. The scales may also be seen on the eyelid margins and behind the ears aside from the scalp. Thuja is another homeopathic cure for Seborrheic Dermatitis when white flakes on the scalp are present. In some cases, the hair of the patient may be dry. In a few cases, split ends and falling of hair may also be present. Homeopathic medicine Phosphorus works wonder in Seborrheic Dermatitis when flakiness one the scalp is present with excessive hairfall. It is an ideal prescription when hair fall is in bunches. In a few cases, the hair may fall off in spots as well. It may be associated with a severe burning sensation on the scalp. In some cases, the patient may also have clammy sweat on the scalp.